Create a beautiful painting of a nutcracker using tints and shades. Also included in this lesson: color theory practice and art study with questions. 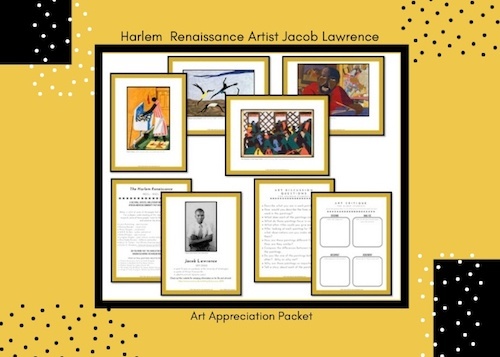 This downloadable PDF Art Appreciation Packet includes: a brief introduction to the Harlem Renaissance, suggested book list, art appreciation questions, art critique sheet, and four images of artwork by Jacob Lawrence. Create a fun collage of a trumpet and music notes in the style of Harlem Renaissance Artist Romare Bearden. Also included in this lesson: how to critique art & practice with analogous colors. Five days of drawing lessons, using lines and shapes to draw three eagles; studying the life and artwork of John James Audubon; using charcoal and watercolors for the final project. Practice symmetry with Lady Liberty! Study the life and artwork of American Artist Peter Max; There are 5 art lessons in the course that includes art history, critique, drawing & painting with watercolors. Drawing and painting lessons in the style of Claude Monet; warm & cool colors on the color wheel, blending, painting and drawing techniques plus a 16 pg. downloadable art notebook to use throughout the course.